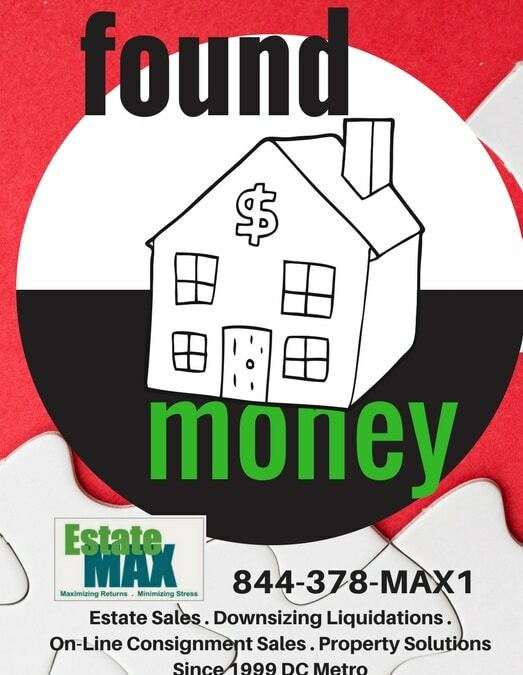 EstateMax/OPS : On-site Estate Sales & Online Auctions 301-332-5585Found Money! ..And Other Stuff- We Do It Every Time! EstateMAX uncovers hidden and forgotten resources in your personal estate through our set up, sales and clean up process! Who knew that Aunt Edna’s Silver was still in the attic under the left front floorboard? Well, maybe an exaggeration, but not so much. Our Team sniffs out the stuff, merchandises and prices it to make our clients the most return possible on the largest volume of stuff over the course of our setup, sale and clean up process! We’ve been at this business for 19 years. After finding the dead parakeet in the Baggie laid to rest in it’s cage in the attic of a home in NW DC, not much would surprise us! Next Next post: Who are you Hiring to Handle your Personal Property Assets?